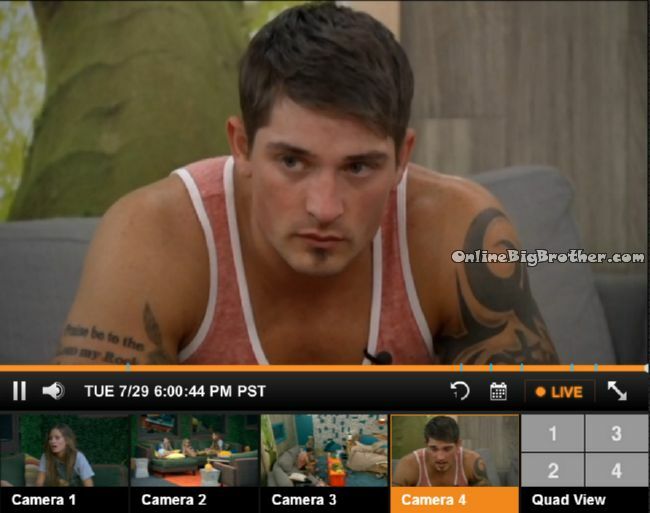 Frankie says Caleb still thinks there is a bombsquad. Derrick can’t believe it he thought he made it clear when he got Devin out. he says the biggest mistake in the game was making that deal with Devin. Derrick tells her straight up They didn’t know about the plan to use Nicole to turn Caleb against Amber. Nicole says Frankie told him it was all the boys that knew. Derrick thinks she should talk to HAyden and cody. Nicole points out that the double eviction is coming up and she could go home if Caleb wins the HOH. Nicole wonders maybe if she waits to see if she needs to say it or not. Derrick says as a reaction it won’t hold more weight it will be seen as a defence hinting she should tell Caleb before Caleb find out. Nicole says Frankie told her there was this elaborate plan and all the guys knew. 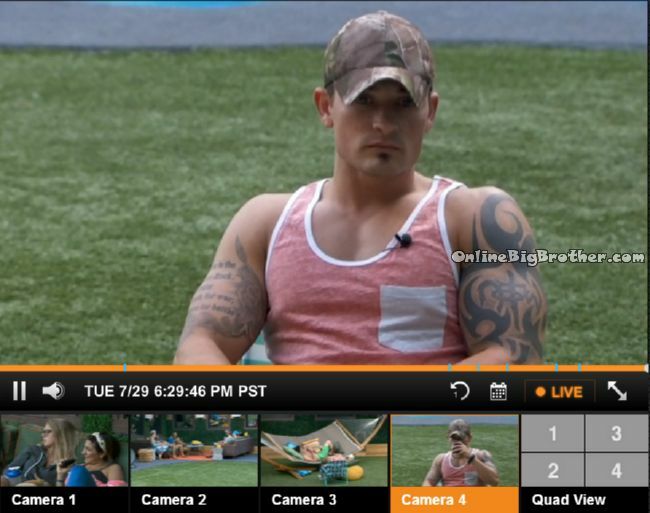 Frankie run up to Caleb and told him Amber blew up the bombsquad to Nicole. Caleb pulled her into the room and asked her and Nicole denied it. She talked to Caleb today and he said things are not adding up with and he’s trying to find if the guy he’s been trusting is lying to him. NIcole is worried she could go home next week if she doesn’t tell Caleb the truth right now. Nicole doesn’t trust Frankie at all she mentions how he’s now denying he said thing to her to cover his tracks. Christine tells her it’s not fair what Frankie did to her. Nicole wants to know what she should do. Caleb says he cares about her, he just has a big heart. I never promised her to take her to the end I promised her i would carry her to the jury along with 7 other people that will help do it with me. Zach agrees “She stayed true. Caleb – She was telling me last night she will take slop for a week to stay in the game,. she would eat a banana” . Frankie – He’s playing an individual game now..
Frankie says when Amber goes home Caleb is working alone period end of story. Cody is down with the blind side. She explains her problem with Frankie. Nicole is worried it might ruin her game. She says Caleb isn’t very smart he hasn’t figured it out yet. Nicole is certain Amber has information that Frankie and the guys want to hide. Yes, Caleb is delusional and he is playing a bad game. However, after Amber leaves it WOULD be a funny scenario if Caleb won HoH and nominated Derrick with either Cody or Frankie. Best case scenario would be Caleb winning the next HoH, breaking apart from Derrick, Cody and Frankie and he could align himself with Donny and Jocasta. Together, they could wipe out the house. One can dream but i’m guessing Production will step in VERY soon to change the game because they know it’s like watching paint dry. (THere it has both of caleb’s favourite lines in one quote I win the day) Well put Simon & Dawg, Well put !! I laughed so hard at this phrasing omg Luv it !! Nicole, you’re so close. Do something. Is it just wishful thinking, that a light bulb went off in Nicole’s head, and she realizing that she and the rest of the house are been played. Perhaps Amber can be saved. They will have to get Donnie to vote out Jocasta, but from what I have seen, Amber is better in competitions then Jocasta. Can they persuade Hayden and Christine to vote out Jocasta? Hopefully the DR will help. Than is a comparison. Then relates to time. Frankie tells more lies THAN just about anyone else in the world. Once they evict Amber THEN they will set their sights on Caleb next. Get over yourself, people are having fun and if a typo happens who cares. I would like to see that happen, but I have a STRONG feeling that even if Amber did stay, she would still work with at least some of the boys (particularly Cody). I just don’t see her totally aligning with the other side even though that would be best for her game. That’s because his b@lls haven’t dropped yet. Difficult to read without punctuation, but good post. Now if Nichole, Derrick and Hayden cast their votes for Amber to stay, that will further confirm to Caleb that Frankie lied to him. That can blow things up! Are you kidding? Listen to Christine? Nicole’s supposedly best friend – who has thrown her under the bus since day 1? Really? Or are you just trying to see how many “thumbs-down” you can get? It really has taken these people this long to figure everything out oh well hopefully someone destroys this detonators alliance already but I thing Caleb is on to them he will find out Thursday then maybe beast mode cowboy will really come out. Not sure which is worse: listening to Caleb talk about himself or listening toNicole whine about everything. Or watching Derrick move around slower than a turtle! Eat, sit, eat, sit, eat, sit, repeat and whisper with his wife…. (my bad)…. I meant Victoria on how to play the BB game! Caleb out douches shia labeouf! Beast mode cowboy needs psychiatric help. Amber needs to go, sorry, she’s a bigger competitor and sending Jocasta home with amber on the block would be stupid. cant wait till Frankie gets exposed and the house turns on him. for his actions saying it was a tough week and blah blah blah. I so agree with you. This is what happens when you get a bunch of people who are not familiar with BB. They seem to think that they must run every thought they have by Frankie. Who died and made him King?? I am muting him time and time again. Please Nicole, listen to your conscience! Seriously Simon. Warn a girl next time. I laughed so hard I spit water all over my son and phone. out of here . I don’t want to watch a house full of guys. I don’t think its a coincidence that the 5 people who have been evicted (already counting Amber) so far were all recruited players. They didn’t know how the heck to play this game and that made it easier for the actual fans to get together and run this game. Maybe that’s why this season has been so one sided so far. That story looks terrifying to me even reading what it’s about gave me chills. Read the book several years ago AFTER seeing the guy speak at a conference. He’s an inspiration. A must read for a lot of folks!! New drinking game: drink every time Caleb says “At the end of the day.” I swear he never talks about the beginning or middle of the day. HILARIOUS screen capture at 6:46:46….you guys are sick puppies, and I kinda dig it. Did anyone else laugh at the picture of Cody and Frankie? Am I the only one that thinks it looks dirty lol? this is why we love #WILDCARD. he has destroyed Frankie’s game, not in the way Frankie thinks. by just forcing Frankie to tell so many lies and then now being forced to keep things from Zach ATTACK, Frankie can’t keep his lies straight. he can’t remember who he told what, why he should tell them that etc. 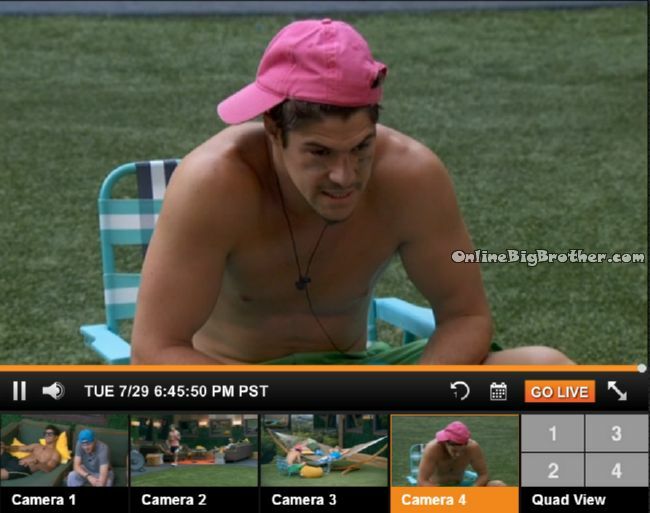 Zach has pretty much ruined Frankie’s game and its not just Frankie. please keep #WILDCARD in the house a few more weeks at least! Hopefully, they go back to one female and one male HOH. Maybe Donny or Caleb could win. Anyone, but Christine on the female side…probably will see Frankie, Zach, Christine, and Jocasta. Maybe Amber tells all as she walks out the door. I like Caleb, I am rooting for him…I don’t think he is a bad guy. He is not the brightest bulb, but he is not a bad guy. He is in love and love can make a fool of you….God bless him. He is not playing a smart game. The other guys (Zack, Frankie and cody) are all afraid of him and are a bunch of backstabbing pussies. I bet they are very much like that in real life as well. Very two faced. I don’t think caleb is and I respect that. I have seen you suffer through a lot of nasty, delusional and tedious stuff on these series…so for you to finally be fed up enough to refuse to cater to the crazy and refer the flash black, instead…means it must be bad! If I was in the house during the last eviction I would of split the votes. Setting it up to target other people. We all know the “alliance” has to turn on each other. Zack is just throwing the fodder under the bus. I hope that when Amber hits the door that Donny and Caleb win HOH, they talk and out Derrick. I wonder what Christine’s husband thinks about her laying with Cody in the HOH bed rubbing his arm up and down. Maybe watching her he see what kind of person she really is. She might find her house empty when she gets home with some divorce papers laying on the table for her. I really hope they bring Amber back . I just want to watch Frankie Nicole and Christine (simply because they’re always scared) sh!t their pants! This is gonna be some good BB Thursday! Beast Monotonous Cowboy is gonna pop-off and the Detonators are gonna be like “OMG, what just happined…… who flipped”? The Detetonators best hope BMC don’t win HOH!! Grab your popcorn and hide the kiddies…. It’s about to get interesting ! Officer Derrick, might want to rethink your “wishing you had a gun”! It seems Caleb’s main goal is to get Amber to jury, no doubt so he can spend time with her there, which is creepy. Hoping she goes this week, so we don’t have to watch him stalking her in the jury house. I agree Frankie deserves anything he gets. But Derrick is the ringleader!! He out lies everyone. Why all the Frankie hate and Derrick gets a pass? These houseguests are sad. They should have gone after that side of the house already. Hopefully we will see that happen.